The anticipation for The Afghan Whigs to return to Kansas City was second to none. Hailing from Cincinnati, OH, this highly influential and critically acclaimed alternative rock band had reunited near the end of 2011 for the first time since their ten-year dissolution in 2001. It was unknown when they had last played in KC, but lead singer and guitarist Greg Dulli assumed it had been at least twenty years ago. 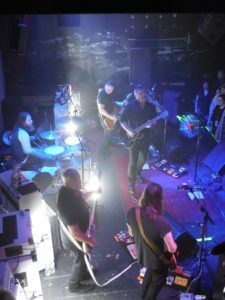 In support of their eighth album In Spades, The Afghan Whigs arrived to the recordBar with opening support by the peculiar pop and R&B singer/actor Har Mar Superstar from Minnesota. Having been to countless shows at the recordBar in downtown Kansas City, this particular fall evening was the most crowded that I had ever seen the venue. 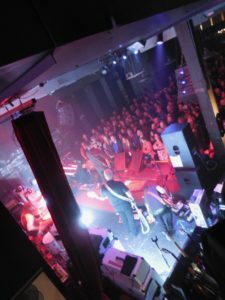 Packed shoulder-to-shoulder on the floor and overcapacity in the upper terrace, those in attendance were fans and musicians from all over the region, including members of popular Midwestern bands such as The Get Up Kids and Ultimate Fakebook who were each influenced by them. Throughout the nearly two-hour set, The Afghan Whigs played songs from every record dating back to 1993’s Gentlemen. They opened with a new song titled “Arabian Heights,” and ultimately playing five more songs from their most recent release within the entire set. Another new song included “Demon In Profile,” which featured special guest Har Mar Superstar on vocals. Major-label hits and fan favorites included “Debonair” and “What Jail Is Like” from Gentlemen, “Going To Town” from Black Love, and “Somethin’ Hot” from 1965. They also transitioned into part of Jeff Buckley’s “Last Goodbye” during “Can Rova” from 2014’s Do To The Beast. In addition, Dulli choose to perform one song from his prolific side project The Twilight Singers’ 2003 album called Blackberry Belle. As he introduced this song, he admitted apologetically that this group never played in Kansas City during their tenure, so “Teenage Wristband” received a warm response from the crowd. Following the main set, The Afghan Whigs’ encore mostly consisted of newer songs written since their reunion from the past six years. They closed the set with a unique version of Don Henley’s “Boys of Summer,” by putting their own dark and soulful, Afghan Whig-esque spin onto this cover. It was a very special evening to witness one of alternative rock’s most influential (and underappreciated) groups of the 1990s with a packed house of anxious Midwestern enthusiasts.